Google promised to reshape the entire look of its OS with the advent of Android L, bringing the flat, almost paper-like Material Design scheme announced at this year's I/O to each of its properties. Now, it seems the new look will indeed extend to the Google Play Store, if leaked photos from an Android news site are grounded in reality. Android Police got ahold of some screenshots showing off a flatter and more streamlined Google Play Store. From the leaked shots we can see the interface has been reconfigured for a simpler look, with fewer frames containing images and text. Rather than splaying out app information across a device's whole screen, the Material Design rehash looks like it will move everything to a centralized pane. On smaller smartphone screens, it seems Google also plans to bring a greater focus to apps themselves. From the purported preview, we can see the description has been bumped to a higher position on the page, while moving stars and sharing options to a lower section. Media on Google's virtual store, including movies and music, will supposedly get the biggest overhaul. 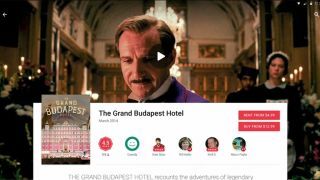 While looking at films, users should be able to play a trailer attached to the top of the page. Music albums meanwhile will have their artwork blown up to stand in as the background for the entire page. Overall it's a much cleaner and more attractive look than the busy webpage aesthetic of the current Play Store. The new look will match the redesigns the search company made to Google Plus and Drive - just keep in mind these are leaked shots from pre-released software. Anything and everything could change before Google actually pulls back the veil on any of these redesigns. Have you met Android Wear, Google's other new OS?